5 stars I am writing this to let you know how much we appreciate your loving care for mom. 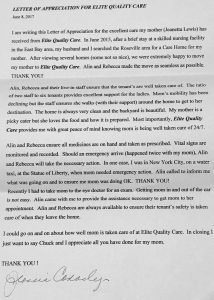 My mother has lived at Elite Quality Care Home for 8 months. We came here after an accident that prevented her from returning to her previous living situation. Though it was initially an adjustment for my mom, we could not have asked for a better place for her. It is not only a lovely home, but has beautiful gardens and is light and airy. There are walkways for the residents to enjoy walking in the gardens and getting fresh air. The home is Exceptionally clean and free of odors. Nutritious meals and snacks are provided. All of these things are important when looking for a home for your loved one, but the most important thing is the care provided. The caregivers treat my mother like they would their own family! They go beyond the job description of providing for the needs of the residents and make their care personal. In addition to the basic care being provided, they look at the individual preferences, providing individualized care. I feel blessed to benefit from the loving care for my mother that I am not able to provide in my home. I am ever thankful for Alin and Rebecca and their diligence in providing "Elite Quality Care". Mom now tells me this is the "best place she has been"! 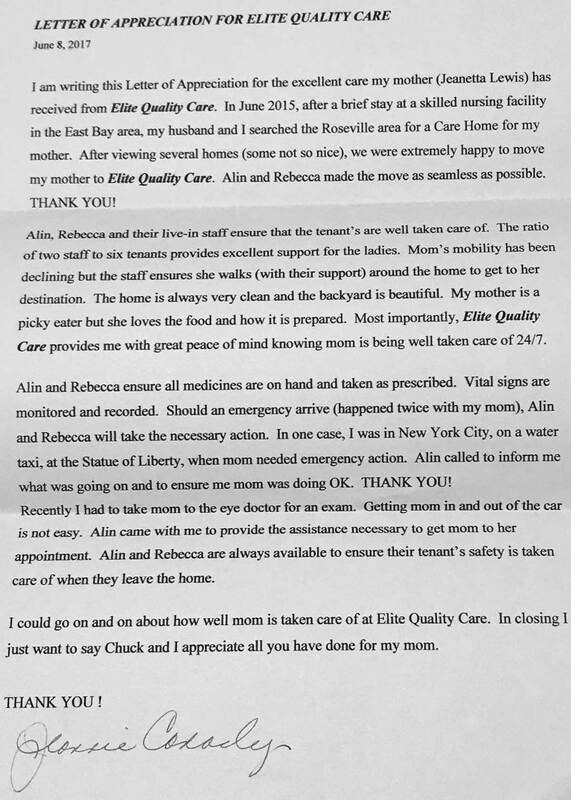 5 stars February 17, 2015 This letter is in reference to Elite Quality Care located in Roseville, California. We had the opportunity to have our mother stay at Elite Quality Care, following her discharge from the hospital. Mom had significant care needs at the time of discharge and was requiring 24-hour care/supervision. Through the “Senior Connection” referral service, we were provided with a list of local care homes. My sisters and I visited a number of these homes and interviewed the staff. We were so blessed and pleased when we found Alin and Rebecca and their beautiful care home just minutes from our own home. The home is situated in a residential neighborhood off of Pleasant Grove Blvd and Fairway Drive, near the Nugget Market. It is beautifully maintained and meticulously clean, while still maintaining a warm and welcoming home atmosphere. Each female resident has a private room with a bathroom in close proximity. The furnishings are beautiful, and some rooms have views of the rose or vegetable gardens. The staff treats each resident like family. They are gentle, compassionate and caring and unhurried. Meals are home-cooked, served family style and provide an opportunity for the residents to socialize. Residents are encouraged to participate in self-care routines, as able. Alin and Rebecca make it a point to get to know each resident and their family so that the care may be personalized to meet the unique needs of each resident. They strive to keep the family informed about any changes or needs for the family member. Rebecca’s medical background is an added bonus, offering peace of mind. I would most highly recommend Elite Quality Care for your family member. 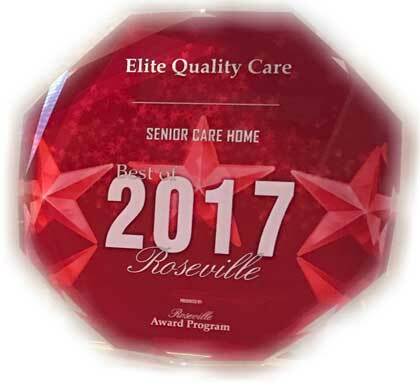 5 stars We moved my 90-year old mother who suffered from dementia to Elite Quality Care when she could no longer reside in the facility she had lived in for the past several years. We were worried that she would not be able to adapt to her new surroundings and that her dementia would prove to be too much for the staff of Elite. Those fears were quickly soothed. Alan and his staff all proved to be extremely caring and compassionate not only to my mother but to my family as well. They really went the “extra mile” to provide the best, safest care for my mom and kept her dignity intact as well. Elite Quality Care was a wonderful solution for a very difficult situation. 5 stars My 90 year old grandmother with dementia was here and the staff and owners were so caring and compassionate. I always felt that she was safe and well taken care of. Alin is such a nice man and the house was always clean, meals looked good, the staff was very sweet. 5 stars Elite Quality Care is a lovely home. It's the cleanest home I've ever seen. The caregivers are wonderful and the residents are happy. They have games, puzzles and social activities for us. Their food is very good. The rooms are lovely and they are beautifully furnished and you could also bring your things in.